Microchipping your pet provides you with a permanent identification for your 4 legged family member. This permanent identification – a unique number embedded in the copper coil coated in silicone – links your address and contact details to a national pet registry. The number in effect becomes your pet’s fingerprint and provides a failsafe identification for its lifetime. Since 1st July 2018, it is compulsory by South Australian legislation, to have your pet microchipped, by the time they are 12 weeks of age. One of our team can inject the microchip under your pet’s skin at the scruff of the neck in a few moments – just like a vaccination. You complete a registration form with relevant contact details which we forward to the national registry. We also complete the registration process by uploading your information to the DACO (Dogs And Cats Online) website. Detecting the presence of a microchip with its unique number is easily achieved with a scanner. Today almost all veterinary clinics and hospitals, animal refuges and welfare agencies own appropriate scanning devices. Even the best loved and cared for pets can escape, stray or be stolen from their homes and become lost. If collars and tags come off, or become worn or unreadable, the conventional identification is immediately lost. Scanning their microchip provides a quick and accurate method to reunite you and your pet. Thankfully most of the public understand that the best place to take a lost pet, is to the nearest veterinary practice. Not only can we scan your pet, but we can ensure that they have not sustained any injuries during their “unscheduled adventure”! 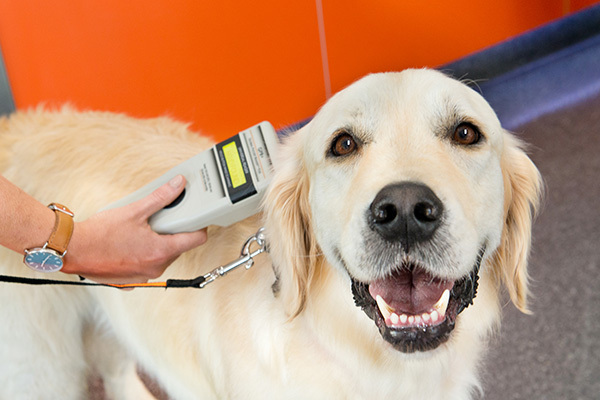 Our microchips are also heat sensitive which allows us to obtain your pet’s current temperature at the time of scanning. No more rectal thermometers! For further information regarding microchipping your pet please call the clinic today on 08 8362 6688.